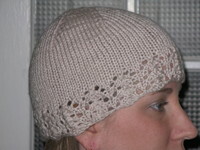 Pattern: Lace Edged Women's Hat, size small. 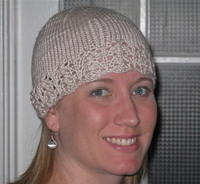 Here is the Ravelry Link. Yarn: Rowan RYC Cashsoft, one skein. Needles: Bamboo DPNs, US 6. Alterations: Increases at the top were stopped when reaching 18 stitches. Impressions: The hat turned out perfectly and was a very easy knit. This is a gift for my grandmother, and I hope it fits here as well as it fits me.